Consumers are told that when they put on an American Apparel t-shirt, leggings, jeans, gold bra, or other item, they look hot. Not only do they look good, but they can also feel good because they are helping US workers earn a decent wage (never mind that some of those female workers have accused their boss of sexual harassment). And when shoppers put on a pair of Timberlands, they feel fashionable and as green as the pine forest they might trek through-that is, until they’re reminded that this green company is in the business of killing cows. But surely even the pickiest, most organic, most politically correct buyers can feel virtuous about purchasing a tube of Tom’s toothpaste, right? After all, with its natural ingredients that have never been tested on animals, this company has a forty-year history of being run by a nice couple from Maine . . . well, ahem, until it was recently bought out by Colgate. It’s difficult to define what makes a company hip and also ethical, but some companies seem to have hit that magic bull’s-eye. In this age of consumer activism, pinpoint marketing, and immediate information, consumers demand everything from the coffee, computer, or toothpaste they buy. They want an affordable, reliable product manufactured by a company that doesn’t pollute, saves energy, treats its workers well, and doesn’t hurt animals-oh, and that makes them feel cool when they use it. Companies would love to have that kind of reputation, and a handful seem to have achieved it. But do they deserve their haloes? Can a company make a profit doing so? And how can consumers avoid being tricked by phony marketing? 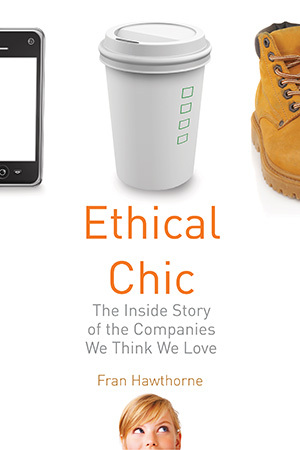 In Ethical Chic, award-winning author Fran Hawthorne uses her business-investigative skills to analyze six favorites: Apple, Starbucks, Trader Joe’s, American Apparel, Timberland, and Tom’s of Maine. She attends a Macworld conference and walks on the factory floors of American Apparel. She visits the wooded headquarters of Timberland, speaks to consumers who drive thirty miles to get their pretzels and plantains from Trader Joe’s, and confronts the founders of Tom’s of Maine. More than a how-to guide for daily dilemmas and ethical business practices, Ethical Chic is a blinders-off and nuanced look at the mixed bag of values on sale at companies that project a seemingly progressive image. Company X is an ideal progressive company. Its products have dramatically challenged conventional thinking while helping people from cerebral palsy patients to schoolkids in Africa to antigovernment protestors in Iran, Tunisia, and Egypt. Its cofounder, a vegetarian, was married in a Buddhist ceremony in Yosemite National Park. Its website posts detailed information about its carbon emissions; moreover, it was the first in its industry to eliminate the most common toxic ingredients. And it has done all this while competing against one of the biggest, most hated companies on Earth. Cutting-edge, creative people wouldn’t think of using anyone else’s products. Company Y, on the other hand, is a terrible company for progressives. Its nonunion employees historically labored long hours at the whim of a micromanaging chief executive who changed his mind at the last minute and made impossible demands. Overseas, it uses Chinese sweatshops so dreadful that a dozen workers have committed suicide. It has been slow on environmental issues, acting only after intense prodding by socially responsible mutual funds and a big public campaign from Greenpeace. Actually, it’s hard to know anything about this company because it’s so secretive that its press people don’t return phone calls. Of course, Company X and Company Y are the same company. The name: Apple Inc. In this age of consumer activism, pinpoint marketing, and unlimited and immediate information, we want the impossible: products and producers that will assure us that we are fashionable, and that don’t pollute, harm animals, or contain weird chemicals, that run on alternative energy, pay their workers good salaries, recycle their scraps, use natural ingredients, buy from local suppliers, donate generously to charity, donate in particular to their neighborhoods, and don’t throw their weight around by lobbying. (Or maybe they should lobby for the right causes) Why should we pay good money for something that will make us look nerdy, or that will poison the Earth? We don’t think we’re being overly demanding. All we’re asking for are the kinds of policies we try to follow in our own daily lives, and if we can manage to recycle and avoid animal products, then certainly big companies, with all their clout, can do likewise. Hard as it is to be so many things to so many consumers, a handful of companies and products--like Apple, Ben & Jerry’s ice cream, Converse sneakers, and the grocery store chain Trader Joe’s--seem to have hit that magic bull’s-eye, at least for a time. Almost no matter what they do, they maintain an image of being cool, fun, and innovative and, at the same time, an equally strong image as green, politically progressive, and ethical. As a result, their customers are fiercely loyal. At Macworld, the annual conference for users and vendors of Apple products, held in San Francisco in 2010, I met fans who had traveled at their own expense from as far away as Iowa, Illinois, and Michigan just to meet kindred souls and to ooh and ahh over the newest add-ons. And mind you, this was a gathering without the magical presence of Apple’s legendary cofounder, Steve Jobs. Meanwhile, Naomi A. Gardberg, an assistant professor at the City University of New York’s Zicklin School of Business, has friends who will drive thirty miles to get to Trader Joe’s. Even during the 2008¬±2009 downturn and the weak recovery afterward, BusinessWeek magazine noted in amazement that stressed-out, debt-ridden, mortgage-foreclosed consumers still found spare change (or unused credit lines) for Apple iPads and Starbucks lattes. They would forgo a new car, switch from brand-name to generic toiletries, and pick up shampoo at discount outlets, the magazine said in an August 2010 cover story. But Apple and Starbucks were irreplaceable. In return, more and more business executives are recognizing that ethical-trendy shoppers are a big and growing market. While the desire to be trendy is nothing new, the other factor--what’s often called corporate social responsibility, or CSR--has burgeoned more recently. The more that businesses incorporate the image of socially responsible hipness, however, the harder it is for consumers. How can they tell whether the picture of happy cows grazing in a meadow is a marketing mirage? Did Clorox co-opt Burt’s Bees? When Starbucks says it buys fair-trade coffee, what does that mean? Investigating a firm’s ethical credentials would seem to be fairly straightforward, because plenty of organizations monitor and produce rosters of “best” companies in a whole range of categories. On the environmental front, according to a directory called the Ecolabel Index, there are at least 365 seals and certifications in 214 countries. For instance, Greenpeace publishes industry-specific lists, including a “Guide to Greener Electronics” for tech manufacturers and a “Supermarket Seafood Sustainability Scorecard”; the nonprofit coalition Ceres issues awards, reports on the sustainability efforts at particular businesses, and posts a list of the eighty-plus “network companies” that have met its green criteria; and the nonprofit environmental organization Climate Counts analyzes the efforts to reduce and measure carbon emissions at the largest firms in seventeen consumer industries. Which companies treat their employees well? Fortune magazine each year publishes its choice of the “100 Best Companies to Work For,” ranking nominees according to their internal communication, training, safety, work-life balance, pay, benefits, nondiscrimination, camaraderie, and so on. Working Mother has a different set of 100 companies that focuses on working moms and criteria such as flextime, parental leave, child-care benefits, family health coverage, and adoption reimbursement. Other magazines have offered their own lists centered on their particular specialties, including Latina Style’s top 50 companies for Hispanic women and Black Enterprise’s “40 Best Companies for Diversity.” An arm of the AFL-CIO posts an annual roster called “The Labor Day List: Partnerships That Work” in order “to recognize successful partnerships between employers and their employees’ labor unions that are working well in the global economy,” as the accompanying report puts it. It’s a little tougher to analyze working conditions at factories overseas. A lot of organizations monitor them, and activists disagree on which to trust. The Fair Labor Association? The Worker Rights Consortium? Verit? TransFair USA? Sweatshop Watch? Labour Behind the Label? Students & Scholars Against Corporate Misbehavior? The Global Union Federation? Specialized Technology Resources (better known as STR)? Regardless of the monitor, the brand-name multinational companies that contract out to those factories should have codes of conduct guaranteeing a right to collective bargaining and free association, labor experts say. Even better--but rare--would be a guarantee of a living wage, not merely that country’s minimum wage (since the factory should theoretically pay the minimum anyway, with or without a code). Still more. For ethical corporate behavior in general, there are lists from GoodGuide, Corporate Responsibility (or CR) magazine, Business for Social Responsibility (BSR), and Green America (which, despite the name, chooses members of its Green Business Network based on whether they are “values-driven” and “using business as a tool for social change,” not greenness), to name only a few. Consumer Reports analyzes products’ reliability, quality, repair record, price, and customer satisfaction. At People for the Ethical Treatment of Animals (PETA), the “Caring Consumer” database names businesses that do and don’t test their products on animals. Concerned shoppers and investors can also check the names approved by the socially responsible mutual funds run by financial managers like the Calvert Group, Domini Social Investments, and Pax World Management Corporation. As a gauge of political leanings, the Center for Responsive Politics has detailed listings, going back more than a decade, of contributions to federal campaigns by companies and individual employees, as well as money spent on lobbying. And I’ve left out dozens of others. All these sources and rankings illustrate one big problem: ethically hip consumers are trying to follow too many--and often conflicting-- criteria. Does the company use organic ingredients? Does it test its ingredients on animals? Does it obtain its ingredients from local suppliers? What if the sole source of organic, animal-safe supplies is imported? What if the organic item looks uglier than the one made with pesticides? What if it’s twice as expensive? Furthermore, are its employees unionized? Does it recycle? Does a company have to pass every “test” to be considered ethical"